These the the Top 10 Players who are capable to win this years MVP Award..
You can vote for your MVPs at the end of page..
What more do you want? James carried the Heat from start to finish, bouncing back from his struggles in The Finals to re-establish himself as the league's most dominant force. James didn't seem at all like a superstar unsure of himself, establishing early on that he would command the floor for the Heat in whatever way necessary. While Dwyane Wade battled injuries, James was busy leading the Heat to a 14-1 record in the games they played without their other MVP candidate. With the Heat in need of a more imposing inside presence, even with All-Star power forward Chris Bosh assigned to the task, James assumed those duties as well, putting that summer school work with Hakeem Olajuwon to good use. Of course, it'll take more yeoman's work in the playoffs to atone for his postseason failures from a year ago. But the revitalized and re-energized James we saw all season appears to be up to the task. Durant locked up his third straight scoring title, becoming the first player to do that since Michael Jordan (1996-98). Lost in the glare of Durant's undeniable scoring brilliance is the fact that his overall game has improved dramatically over the past three seasons. He posted statistical career highs across the board, including rebounds (8.0), blocks (1.2) and minutes (38.6). We're talking about 23-year-old wunderkind just five years into a career that could very well go down as one of the greatest the league has seen. The model of scoring consistency, Durant's numbers in wins (28.0) and losses (28.1) was nearly identical and he was just as good before All-Star weekend (27.9), when he put on a dazzling show, as he was after (28.2). He won't be held off much longer. Durant's too good to finish another season without claiming an MVP trophy. Bryant could have suited up last night and chased that scoring title. He could have laced up his shoes, unleashed the Kobe System and lit into the Kings for 38 points or more and snatched the scoring title that seemed to be his all season. But Bryant has bigger things on his mind this season ... he is chasing that sixth Larry O'Brien trophy to add to his collection. For Bryant to play this well 16 years into his career is a testament to his talent, desire and relentless determination to be not just the greatest player of his generation but more importantly one of the greatest of all time. His 27.9 points, 5.4 rebounds and 4.6 assists are impressive. But the number that really sticks out is the 38.5 minutes he averaged this season, a truly staggering figure for a player who has played as much regular season and postseason basketball as Bryant has the past decade and a half. The Clippers are in the playoffs for the first time since 2006 because they wrested Paul away from the crowd in training camp in a deal that could very well change the the franchise's future. Without Paul, the Clippers were an exciting bunch that filled up highlight reels. With him, they are filling up the win column regularly enough to challenge the Lakers for the Pacific Division crown. In the seemingly never-ending debate about who is the league's best point guard, Paul's case is as rock solid as it gets. His numbers combined with his leadership, competitiveness and a penchant for playing his best with games on the line provides the Clips a bedrock player they haven't had in ... perhaps ever. For a stretch this season it appeared Parker might have a legitimate shot at adding some MVP hardware to The 2007 Finals MVP trophy already on his mantle. While Manu Ginobili was out with an injury and Tim Duncan was easing his way into the season, the Spurs were leaning on Parker to carry them. In typical Spurs fashion, Parker did his work without much fanfare. We could wax about Parker's numbers -- 18.3 points, 7.7 assists and 2.9 rebounds -- or we could focus on the more important digits. The Spurs clinched the No. 1 spot in the Western Conference three days ago and will own home court advantage at least through the conference finals. Peel back the layers on the Spurs' season and you'll find Parker. Love's season ended prematurely, courtesy of a concussion and the fact that the Wolves were out of the playoff race and didn't want to toy with the face of their franchise. There shouldn't be any more questions about the abilities of Love, whose two-season run marks one of the most impressive rises from maligned rookie to All-Star that we can remember. Glowing endorsements from Hall of Fame power forwards like TNT's Charles Barkley bolster the argument that Love is the leader of the up-and-coming pack. His scoring (26.0) and rebounding (13.3) place him in a category of one, in terms of players who rank among the top five in the league in both categories. But it's the constantly improving shooting touch from deep that makes the league's reigning 3-point shootout champ stand out. There's a healthy debate to be had as to who had the better finish to this season between Rondo, Kevin Garnett and Paul Pierce. But there is no debating that from the start of the regular season until last night's finish, Rondo has been the Celtics' MVP. His run of 24 straight games with double-digit assists, the first of its kind since John Stockton was doing his thing, is not being fully appreciated in a point guard era that values scoring over facilitating. Rondo's ability to dominate the game on both ends without having to rely on scoring makes him one of just three players (James and Dwight Howard are the others) capable of doing so on a consistently elite basis. Rondo at his best makes the Celtics a serious threat to the Heat and Bulls in the Eastern Conference playoffs. If the Westbrook we saw in the regular-season finale against Denver -- he finished with 30 points, six boards, nine assists, three steals and four blocks -- was the guy who showed up every night, he'd have finished in the top half of this list. He's capable of that sort of production on a nightly basis. As he continues to develop he'll continue to push his way through the crowd and up the ladder. But there are holes in his game that remain. He's far too careless with the ball (3.6 turnovers) for a guy who averaged just 5.5 assists this season. And if he's interested in shaking that "not a true point guard" label, he'll have to do a better job of picking and choosing when to take over games and when to get his teammates, even the ones not named Durant or Harden, into the mix. A series of nagging injuries limited Wade to just 49 regular-season games in an abbreviated season, which would have sunk the Heat pre-Big 3. 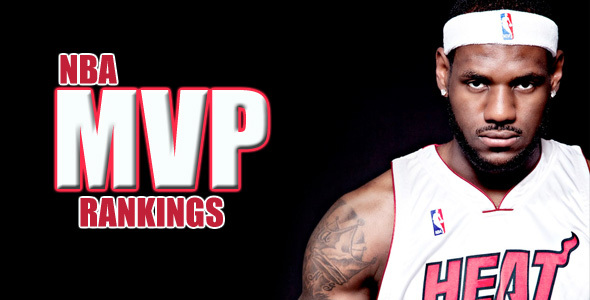 The Heat's performance in his absence (14-1) is one of the strongest factors in favor of the MVP candidacy of LeBron James. This was not anything close to what Wade is used to, let alone the sort of season Heat fans have grown accustomed to seeing from him. His season averages in scoring (22.1), rebounds (4.8) and assists (4.6) were all down from his career numbers, as was his shooting percentage (27 percent) from 3-point range. With all of that said, we must not forget that Wade remains one of the league's truly elite talents when healthy. And he's going to be extremely well-rested come playoff time. The Knicks probably will have to deal with a motivated Wade who won't start the postseason on dead legs. Back surgery for a herniated disc cost Howard the chance to finish the regular season and participate in the playoffs. But a training camp trade request, followed by those trade deadline shenanigans, stained this campaign for Howard from the start. The fact that he put up MVP numbers (20.6 points, 14.5 rebounds and 2.1 blocks) throughout the season with all of that extra stuff going on speaks volumes about the talent and abilities possessed by the man who -- sorry Andrew Bynum -- is still the best big man in basketball. With Howard healthy and in uniform, the Magic were a legitimate threat to the come out of the East, even with the dysfunctional working relationship between Howard and Magic coach Stan Van Gundy. Without the big fella, who is not even expected to be in attendance in street clothes for the playoffs, the Magic could be headed for a quick exit. Who Will Win This Years NBA MVP Award?